Being a family owned business, we like to run the nursery like a big family. We thought a fun blog project would be to invite all of our employees to make their own Succulent creations. We are asking one employee a week to do so. At the end of each week we will “showcase” that employees design at the nursery, on the blog, and on our Instagram. Week 1 is with Ashley, our Production Supervisor, who has been with us for 5 years. Ashley has decided to create a living wall using an old pallet. 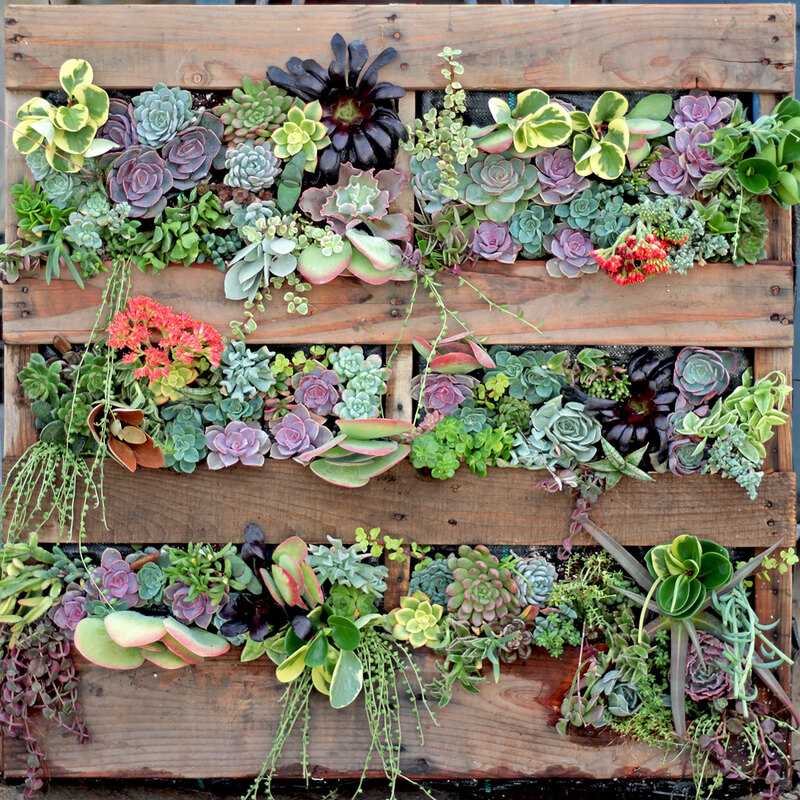 For her project she chose to create a living wall out of one of our old pallets. We are excited because this wall is mostly made of indoor plants and will look great in our new office space once it is rooted. The other employees are not so happy because now the “bar is set high” for the rest of them! How long did it take to make it and how many plants did you use? How exactly did you make it? “I used ground or weed cloth and stapled it to the back and in the inside. I then filled the pallet with soil and cut holes for the plants. Then, once the plants were in I watered the whole thing. Now, we will have to wait at least a month to hang it, so that the succulents can root." What are some of the plants you used and why? "I used bigger plants so that they can spread out more. Some examples of other plants were: Echeveria, because they like to be hanging. String of Pearls, because everyone loves those and when they grow they will drape well and hardy Sedums to fill in the spaces." What are your favorite Succulents? "The ugly and weird looking ones, like Gasterias and Haworthias." What are the most difficult succulents to work with? "Those would be the Haworthia, Euphorbia, and Hardy Sedums. Haworthias are difficult because they are easily confused with one another, and difficult to identify. Euphorbias are spiny and require protective gear so they don’t irritate the skin. Sedums are difficult because they are tedious to plant, they overgrow very easily, and they can be tricky to make look nice." Why or what do you love about working at MCG? 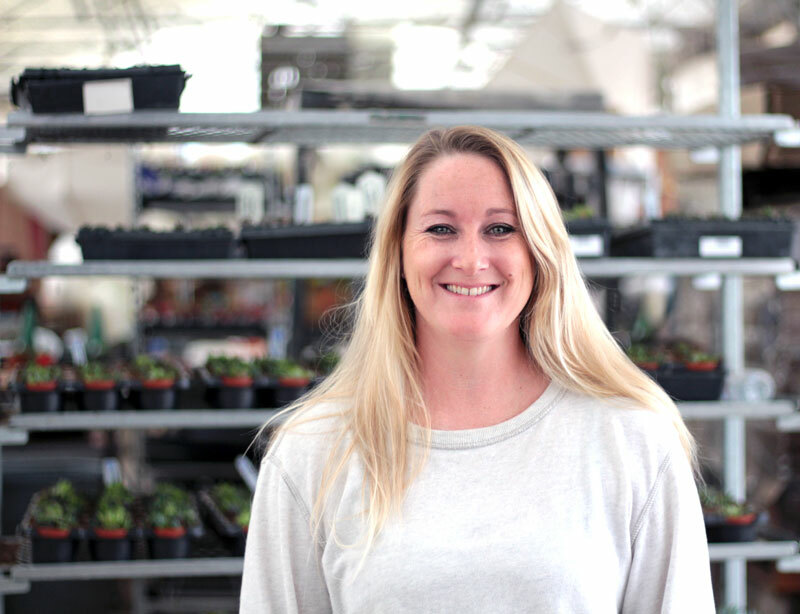 "I love working for Mountain Crest Gardens because I am always learning, I also enjoy traveling to succulent events and meeting new people." Ashley ends our conversation telling me "I like to always challenge myself and I had wondered if I could make a wall like this and I am happy that I was able to do it and that it turned out so well!"